He'll be challenged in AA by Riverside's Calvin Wetzel. Last year, he went 38.86 to take fourth in the state final. Expect Wetzel and Tomlin to match up at WPIALs before states and those should make for some good races. Those two are the only returning AA medalists in the event from last year. Derek Herr of Littlestown (39.19 best from a year ago) and Payton Rohrbaugh of Bermudian Springs are the only others in AA with sub-40 times from last season. In AAA, Ayden Owens, the second best 300-meter hurdler in state history, has graduated. There are two returning state finalists/medalists from a year ago. Luke Meckler of Pine-Richland took sixth last year and is one of just three sub-39 returners and the only one in AAA. His best time, 38.80, came in the prelims at states. He'll look to convert that into a state title this spring. Northeast's Godwin Kabanda ran his best of 39.32 to take eighth place in the state last season, and he should be a factor again this season. A number of others have sub-40 second times to their name that should make it very interesting, and certainly very wide open. State College's Zachary DeCarmine was ninth in the prelims at states last year. He's back with a 39.39 best from last season. 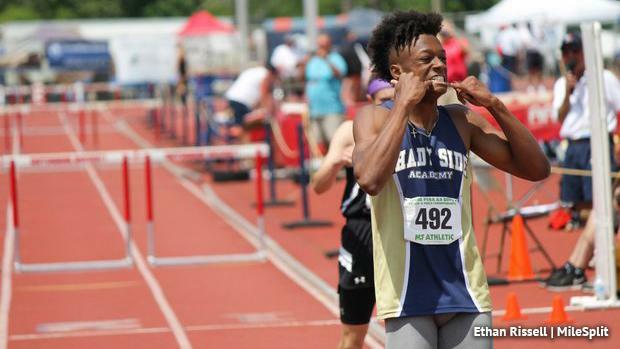 Abington Heights' Antonio Maletta (39.13 best), East Stroudsburg South's Powell Posten (39.15 best), North Allegheny's Donovan Rice (39.41 best), and Ridley's Tony Graham (39.59 best) all narrowly missed that state final last year, too, and are back this spring. Williamsport's Allen Taylor could also factor in. He ran 39.45 last season and then followed that up with a strong 1:03.36 in the 400-meter hurdles in the summer.